The Aston Martin Vulcan was named after the bomber, not the Star Trek species, apparently. Which makes sense. One was conceived to be noisy, obviously threatening, heinously expensive and limited in production and was destined to spend most of its time ready to run but actually mostly sat idle. The other one majors on logic. And whichever way you look at it, there’s nothing terribly logical about an 820bhp 7.0-litre V12-powered car that you can drive only on track days that have remarkably liberal noise limits. The Vulcan measures at 118dB when its exhaust is in angry mode but can be reduced to 103dB with optional baffles in place. For a while, anyway. It fairly quickly destroys them and blows clean out through the exhaust, whereupon it becomes noisy again. The Vulcan is an insatiable kind of car. Aston is establishing a new way of doing business that sounds comfortably organised but, when you meet people who work there, spells out very little rest at all. There’s one full new model a year – this year’s is the DB11 – which is then supplemented by a number (probably two per annum but perhaps more) of limited-run specials, such as this Vulcan, a special car even by the standards of special cars. 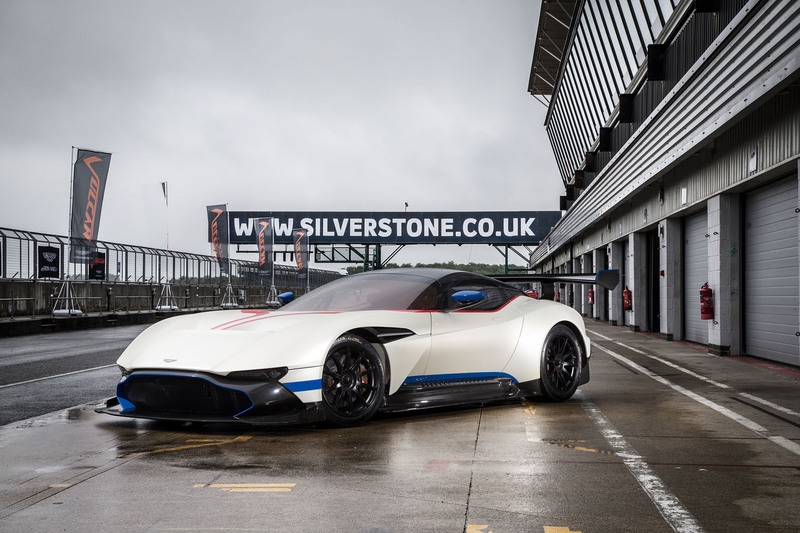 One reason it’s doing them is because Aston Martin’s boss, Andy Palmer, is rather keen to see his company making money – which would be something of a novelty – and the cashflow that the special projects bring in is the kind that is well worth having. The other reason is that… well, just look at it and imagine what it does for Aston’s status as a maker of sports cars. There will be 24 of these Vulcans, each priced at £1.5 million plus local taxes. And although £36m wouldn’t cover Audi’s annual biscuit budget, it’s the kind of revenue that’s useful to a company the size of Aston Martin. There will be ongoing revenue, too. All 24 cars are sold (there were 24 because of Aston’s successful history at the Le Mans 24 Hours), but Aston will continue to look after most of them. It’ll maintain and service them, prepare them for track use and run a series of events every year where owners can come and drive, be tutored and so on. Aston will train your technician if you’re so inclined, so you can take your Vulcan home, or put it on a plinth and look at it. There are reasons why you might do that. I’m not convinced the Vulcan is a beautiful car, but I’m not sure it was meant to be. It is a striking one and, better than that, is exquisitely finished, inside and out. 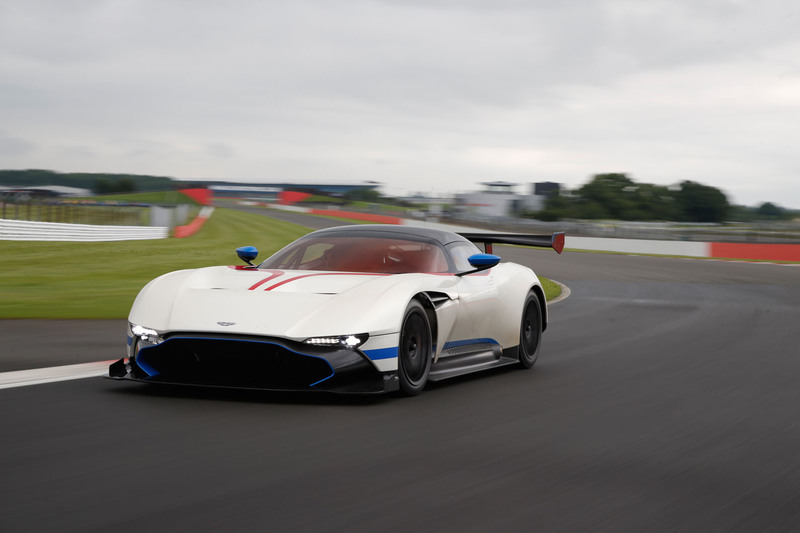 There is a certain race-car feel to the Vulcan, which I’ll come to in a moment, but in terms of its finish – each rear light is like 100 plastic lollipop sticks carefully inserted into the back of the car – it has all the hallmarks of a concept car. The same is true inside, where what could easily feel raw and exposed instead feels like something a film model maker would put together, with fabulously crafted finishes and material choices. The positioning of the controls, though, could only have been done in close conjunction with a racing driver. That stands to reason, I suppose. If you’re going to make a track car – and the Vulcan is a track car only for now – you might as well ask racing drivers to help you out. 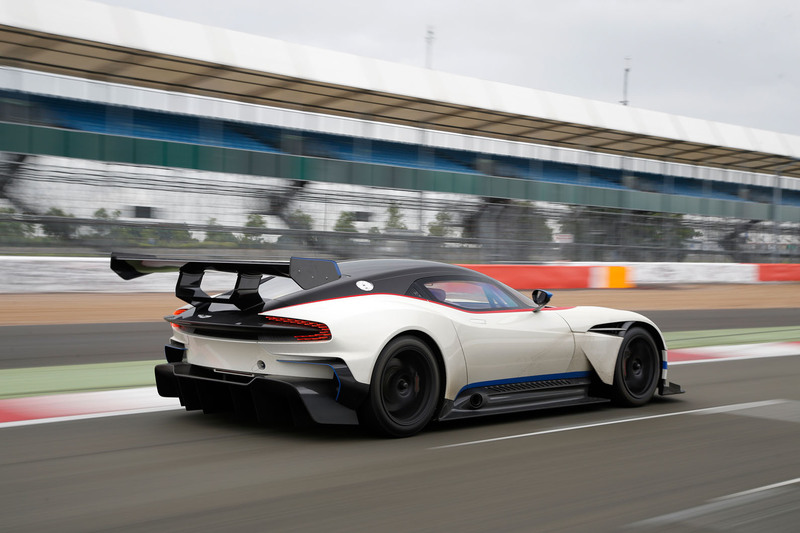 So Aston Le Mans driver Darren Turner and GT3 racers Peter Dumbreck and Joe Osborne have all spent serious time in the Vulcan during its development, and it shows. The construction, then. It’s pretty racy. 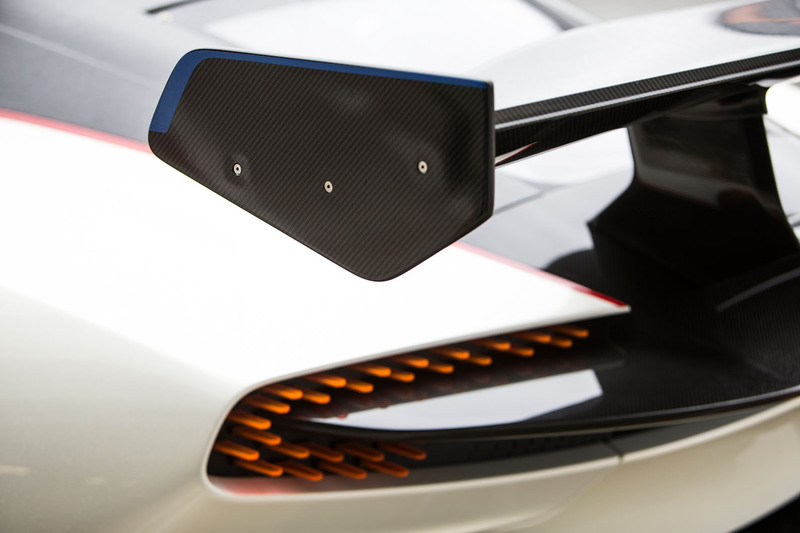 The carbonfibre tub is a development of the one that featured in the One-77. By all accounts, the One-77 wasn’t the world’s greatest car to drive (that Aston didn’t want car magazines to drive it was a giveaway) but there wasn’t much wrong with the carbonfibre tub. So there are similarities here, but given that there was no need to keep it the same, it hasn’t been, although there’s still an integrated roll cage. From the front and rear are hung aluminium subframes. At the very front, it supports a shedload of radiators beneath an enormous carbonfibre bonnet, and behind that – and behind the axle line, significantly – is one of the world’s largest, greatest naturally aspirated V12 engines. At 7.0 litres, it’s “based around the architecture” of the 6.0-litre engine from Aston’s GT3 racing car. But again, that’s a modest way of putting it. If I were creating an engine with a new block, pistons, liners, conrod and crank, I’d be inclined to consider that a new engine. Many manufacturers have called an engine ‘new’ after far fewer modifications than that. In any case, the numbers are startling. On its maximum power setting (there are three to choose from), it’ll make 820bhp at 7750rpm. Owners – not necessarily vastly experienced track drivers at the start – might want to build up to maximum oomph in the lower modes, which provide 550bhp and 675bhp to be getting on with. That’s probably plenty, to be fair. The V12 drives the rear wheels via a pure race gearbox, a six-speed straight-cut transaxle unit by Xtrac. Its gearshift paddles are attached to the back of a wheel that you have to hold at a quarter to three, because half six isn’t appealing and there’s nothing at midday. Normally, straight-cut ’boxes are the loudest thing you’ll find in a car, whining away as revs rise through them. But given the noise of the V12, I suspect this one will be an exception. From the subframes are hung double wishbones front and rear, with four-stage adjustable passive dampers, and adjustable anti-roll bars. Like a race car, there’s lots of adjustment in everything. And the Vulcan runs on Michelin Pilot Sport Cup 2 tyres until you get the hang of it, although you can put full wets or full slicks on, if you like. Our drive is at Silverstone, where conditions are… iffy. It is Silverstone in July, after all. So I stay on the Cup tyres. It also means I put the power mode on 550bhp when I get in. Or as some of them like to call it, ‘Mach 1’. The power knob doesn’t change the rev limiter, and it doesn’t adjust the stability control – because there isn’t any. But there is a switch to alter how early the ABS cuts in and another to determine how fierce the traction control is. I leave both at ‘medium’ for the most part. Regardless of the fact that it’s ‘only’ in 550bhp mode, the Vulcan feels intimidating at first. The driving position is low-slung, although not quite as low and visibility not quite as appalling as in most GT cars. But forget about seeing the end of the bonnet. Or the start of the bonnet. 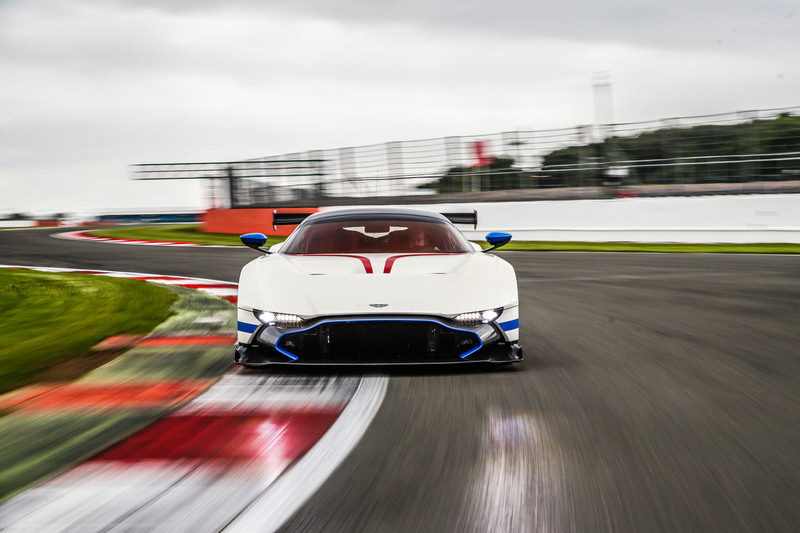 The Vulcan – at 2.18 metres – is a wide car, but then it’ll mostly be used on wide race tracks. There are two seats: a fixed passenger one and a sliding driver’s one. Both get six-point harnesses and an intercom, so your tame Aston race driver can give you tuition. There are three pedals and a big gearshift indicator on the digital dashboard. Toggle switches to your right. To your left, the door, which, now that you’re strapped in, you can’t reach to close. Well done. The big start button on the bottom of the steering wheel, then. BLUM. The Vulcan is the kind of car that’s best started outside. The clutch is sharp, although you can forget about it once you’re rolling, and the Aston’s is the kind of engine that doesn’t appreciate being dolled around on part-throttle for car-to-car photos. Nor sitting at idle waiting for them. It has all of the urgency and grumpiness of a racing car’s, so desperate is it to be given its head and allowed to make the car’s aero (of which there is a lot) and cooling (likewise) work properly. So I let it have some positive throttle. I was right about something. The engine manages, in this case, to compete manfully with the gearbox. Throttle response is fabulous – just electric, even in 550bhp mode, which… well, you don’t want to know about 550bhp mode. Nor do I, so after a brief acquaintance with it – yep, it’s quite fast – I flick to 675bhp and get a nudge in the back on steady throttle for my trouble. And then through to the full 820bhp. Whomp again. The thing is, 820bhp is within the realms of some road cars these days. Neither a Lamborghini Aventador SV nor a Ferrari F12tdf is a million miles away, and both feel – big, naturally aspirated V12s that they are – quite the event. Neither of those, though, weighs only 1360kg wet, and neither has the purpose, antisocial nature and downright urgency of the Vulcan. It is intense. And yes, the Vulcan has less power than a McLaren P1 or Porsche 918 Spyder, but it feels as fast as either of them and is more immersive than both, yet more straightforward than both, too. Straightforward? Sure. The engine is in the front, more or less, drive goes to the rear wheels and there is no turbocharger or electric power boost. Quite simply, it feels like a GT racing car. It’s impossibly fast and urgent in a straight line. Peak power is at 7750rpm and peak torque – 575lb ft – wants 6500rpm before it arrives, so the big engine thrives on revs. Gearshifts are brutally fast on the upshift and perfectly blipped on the downshift. The brake pedal is firm but brings about brilliant stopping. It’s the agility that’s shocking, although I suppose it shouldn’t be with a lower kerb weight than a typical hot hatchback. The Vulcan is immensely eager to turn in, with no desperate need to trail the brakes as you do, to settle the nose, as you would on a big Aston GT car, although it does help a bit. But the dilemma of unwanted body movements versus ride quality is not something, you suspect, Aston has had to concern itself with too much. I don’t doubt it’s stiff but, in these conditions, I’m giving kerbs a wide enough berth not to find out. Silverstone is otherwise about as lumpy as my kitchen worktop. Still, it’s worth keeping the nose on line on the way in, guided by steering that’s relatively light but feelsome and pretty fast – as it has to be, given the limitations placed on where you can put your hands – yet still stable in a straight line. That’s the nice thing about that amount of aerodynamic downforce and drag, and suspension you can set up how you like without worrying about road cambers and bumps and so on. It can be hugely alert and fast, yet also utterly stable – the way GT racing drivers want it. I digress. From mid-corner onwards, the Vulcan does behave a bit like a big GT car; too much throttle will straighten its line, and that doesn’t have to be a lot of throttle in iffy conditions. Even a steady throttle and falling camber introduces some oversteer, and although there’s no stability control, the traction control does a passable impression at the limited slip angles you’re likely to see. A wrist flick pulls it smartly back into line, and the absurdity of it is that, after a few laps, you find yourself willing this £1.8m hypercar to step sideways so you can catch it, trouble the traction control, feel like a hero and drive onwards. Which, let’s face it, was entirely the point. You get out sweaty and tired from the physical efforts of managing a car with such huge potential, one that feels like a racing car in every inch of its dynamic make-up, yet at the same time it’s more approachable and more faithful, because it is you – the collector, the enthusiast, the driver – who is going to be holding back the performance, not the handling set-up. The Vulcan is your blank page, your personal trainer. It will always be as good as you can be. It is the £1.8m equivalent of buying a race-prepped two-stroke kart and challenging yourself to get the best out of it. Which sounds like a folly, and probably is, were it not comfortably one of the best cars I’ve ever driven. All the integrity of a racing car with all the finish of a concept. It’s magnificent. I agree with xxxx. As usual with Autocar, they do not quote acceleration figures or top speed on this limited production car. So again totally pointless. And anyway all Vulcans are already sold out. Why make it look like a road car sort of device if it's a track machine, with all the performance compromises that entails? Surely they would have been better off building a F1 or Lemans replica? Matt, it is simply untrue that "by all accounts, the One-77 wasn't the world's greatest car to drive" (unless, perhaps, you mean it in the absolute literal sense that NO other car is greater). A few journalists have driven a One-77 and LOVED it (Harry Metcalfe, for one), saying that while the gearbox wasn't its best feature, it was an extraordinary and wonderful car to drive. About the comments above: Seriously, you're more concerned with a "pointless" 0-60 time for this car rather than interested in hearing what it actually feels like to drive?? ?